Discussion in 'Downhill & Freeride' started by General Lee, Mar 13, 2008. Fraser put together a UCI team this year with bikes to match (though the Canadians will still be on Oranges). After a couple years on bright green or orange bikes I'm liking the gloss black finish. Should have new graphics in a few days. Same style but they will be bigger and the blues will match. I like it but I'm a little biased. what stem lenght is that? Is that IH sticker size and color stock? or custom? because it looks tight. thanks, Stik. It's custom. I took the '08 font and messed with it a bit in Adobe Illustrator. Actually my girlfriend did all the work and I just made suggestions. I have no idea how to use that program. I have new graphics coming that are the same but about 1/4" taller and about 2" longer overall with a slightly brighter blue to match the fork. Lee, bike definately looks cool in black. Looks very clean and mean... say - didn't you have some kind of wild argyle decal graphic on the front end of that thing or am I just imagining things??? I like this however - very cool. Those bars look really wide. Maybe its just the angle. which bar is ist ? i think i just saw the frame your thinking of in the classifieds. . . ? you are thinking of the '07 frame i painted, which is now for sale. 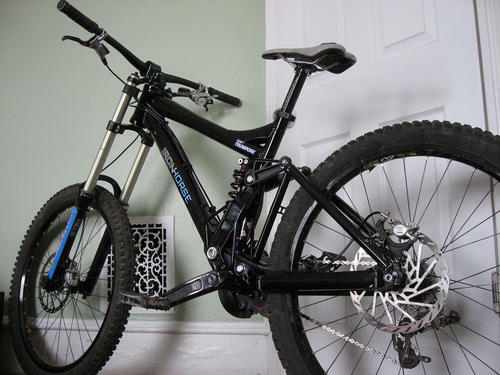 The all black one is an '08 world cup frame. Just curious why the Transcend team rides Ironhorse in the US and Orange in Canada? I am running 2 separate UCI teams this year. The Transcend UCI team was put together to help out a few juniors attend World Cups. We had plenty of extra space so I am also helping out a few friends. The team has no specific team sponsors in order to enable the juniors to arrange for their own personal sponsors. The 2 Canadian Juniors are on a program of Orange / Fox / e.13 / Thomson that I put together for them. The Mojo / Orange / Transcend guys are all on Orange 224 Evos with Fox Suspension, e.13 guides, Thomson posts, Maxxis tires and Fox Clothing. 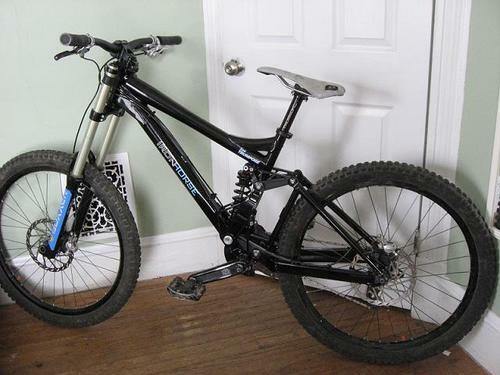 Dumb question o' the day - what kind of stem is on both the bikes pictured? Looks long and I've been looking for something longer than 50mm. Looks like a regular Integrated Funn Stem, they can be set for 40 or 50mm reach. Oh, duh...right. Just looks 70mm-ish in the pics for some reason. yeah, what Fraser said. Dave and I decided to stick with the program we already had with Iron Horse the past 2 years. That looks really good! What did you do for the fork stickers? 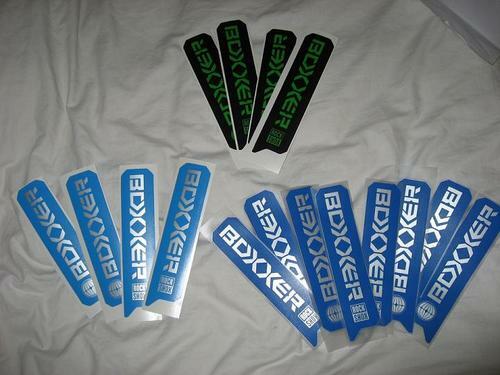 Is that the normal boxxer plastic piece with a sticker on the backside? I want to do something like that for my fork and sticker design. The ones on the bike are actually stock. While I was painting the argyle frame i really carefully masked off the boxxer stickers and painted them blue so they would be a perfect match and ran a thin layer of clearcoat over them when i finished the frame. Not recommended unless you've had a bit of practice with that sort of thing. However, since I sold that frame I had a friend with access to the proper equipment make me up some new ones that will better match the frame graphics (both the custom blue graphics and the stock green ones). Needless to say he got a bit carried away and we ended up with a pile of them. Sorry, they are not for sale but any decent sign shop should be able to make boxxer graphics for you in whatever color you want for about $50. I stand corrected - I had NO idea that was painted. That is some pretty insane paintwork going on there. Who the hell did that? - AMAZING job. I think he did that. yeah man that is rad, finally a return to some simple clean lowpro bikes...all the bright flashy junk is getting a bit tired.. So says the guy who's waiting for his chrome bike to show up. Here are the frames that the Junior riders on the Transcend Magazine Team will race on this season. Weight came in at 8.6lbs with all the shock hardware and rear axle attached but without the seatpost clamp. The Sunday looks sick Lee, very very nice! Looks better without the Argyle IMHO, really sleek. 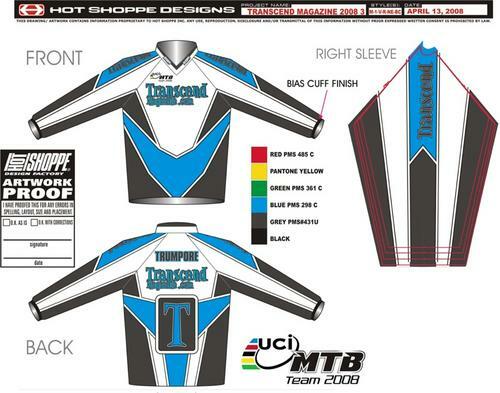 Transcend Magazine 2008 team jersey.